Anet Artinyan was born in 1973 in the town of Plovdiv. She graduated the Secondary School of Music "Dobrin Petkov" in 1992 in Asya Byandova's class in violoncello. In 1996 she graduated the State Musical Academy "Pancho Vladigerov" - city of Sofia in Bogomil Karakonov's class in violoncello, in 1997 she completed a master course and was conferred Master Degree. In 1997 she continued her education in the higher School Folkwang in the city of Essen, Germany in Yang Chang Cho'sclass in violoncello; in 2002 she was conferred Consertexamen Degree and awarded Diploma for Soloist – Performer. 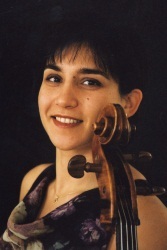 In 1999 she enrolled to study Chamber Music in Andreas Rainer'sclass and successfully completed it in 2001. Concert experience as a soloist and chamber performer in Bulgaria, Germany, Holland, Greece, France. Soloist of the orchestras in Plovdiv, Shumen, the Academic Orchestra of the State Musical Academy "Pancho Vladigerov" – city of Sofia, the Philharmonic Orchestra of Sofia, Wuppertaler Symphoniker, concerts on the festivals "Musical Weeks in Sofia" and International festival of Chamber Music – town of Plovdiv. Records for Bulgarian National Television, Bulgarian National Radio, German television, WDR, "Deutsche Welle" and the Greek television Ed3. Since October 2003 she has been a free-lanced Assistant in the State Musical Academy "Pancho Vladigerov" – city of Sofia.